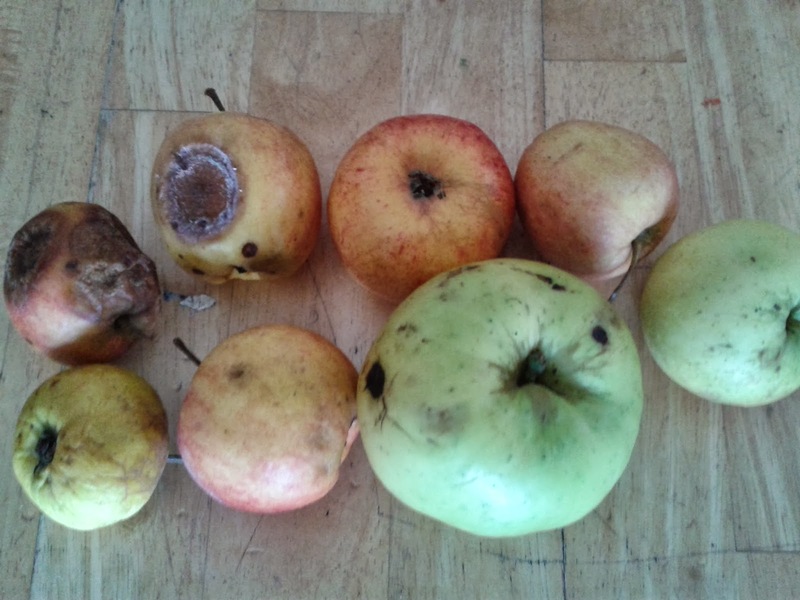 I know that apple season is coming to an end, and that this post would have been more useful about 2 weeks ago, but anyway, I would like to share here how I got 4 (or 5) products out of apples that were not the best to start with. Once you have apple pulp, drain it through a colander to get much of the juice out (the obvious juice, don't try to extract all of the juice as you don't want dry stewed apples). Spoon the stewed apple into clean, scaled pickle jars. (Pickle jars should provide enough apple for making pies or for breakfasts for a family, smaller jars such as peanut butter jars would do two people for breakfast with yogurt and granola (yumm)) So now, you need to can the jars of stewed apple, see post about canning for more details, because the jars are fairly wide, heat it water to 77 degrees and keep it there for 40 mins to ensure that all of the jar's contents are sterilised. 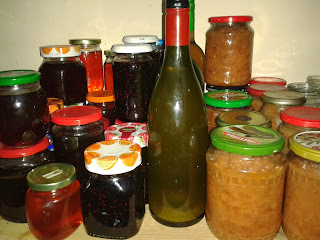 http://rerootingthefuture.blogspot.ie/2013/09/elderberry-cordialsyrup-and-elderberry.html There is no added sugar in this, so once the jar is open, use immediately or refrigerate and use the following day. Strain the juice through a jellybag, coffee filter or nylon sieve, retain what was filtered out and add that to any remaining stewed apple, place this in the freezer till you have enough of it to make apple cheese, (recipe will follow in a few weeks). You now have two choices, you can drink the apple juice or make it into jelly, follow link for a jelly recipe. http://www.davidlebovitz.com/2010/10/apple-jelly-jam-recipe/, boil up a few crab apples in the juice and then remove their pulp before adding the sugar and making jelly, crab apples contain a lot of pectin and will help your jelly to set, especially as the first step removed the most pectin rich part of the apple. If you want to keep the juice for drinking later, you will need to sterilise it, this could be done by boiling the juice and immediately pouring it into a very clean, hot bottles, this should keep for a while, or you could can it. I often make stewed apples from soft, bruised, older apples, but I really love your tips for making five products from them. So glad I found your helpful post at Frugal Days, Sustainable Ways.